Maytag Laundry Lounge | Sealy Design Inc. When it comes to a stunning laundry room all about power and performance my instincts were to showcase sleek lines, symmetrical proportions and rectilinear spaces. These attributes inherently portray strength and power at a subconscious level. 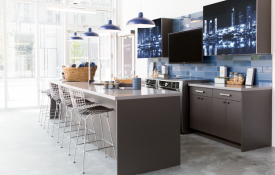 While many laundry rooms are more traditional in nature, with the Pan Am and Parapan Am Games coming to Toronto, I was challenged by Maytag to create a laundry room inspired by the strength and power of the athletes themselves. So, in contrast to many laundry rooms you might be familiar with, our design celebrating these accomplished athletes focuses on a very structured space where each quadrant mirrors the one opposite, creating a feeling that the design radiates from the centre of the space. No room that speaks to these millennial athletes would be complete without adding a few gadgets and technology. So this space has a large TV, a beverage fridge, integrated music and a steamer. This of course is also practical since most people fold and iron in front of the TV, so why not integrate one into the space? The choice of colours and material also take into consideration the athletes’ perspectives. Our palette is darker and richer than the more traditional all white laundry rooms we’ve being seeing of late. The colour palette creates an inviting space and the materials, such as quartz countertops, are durable so you know it’s an ideal ‘working’ space. Now let’s not forget the details… we wanted a strong, structured design, so we overhung countertops to help tuck in our cabinetry hardware and added deeper gables to finish the look. This creates a very clean design and helps keep hardware from getting caught on laundry as you are moving around the area. This “flush” detail is a seemingly small element that would appear trivial if not for the way we’ve been consistent in applying it across the entire design to create a powerful impact. Our laundry room is just as functional as it is aesthetically pleasing. While this laundry room is inspired by the strength and power of the athletes themselves (not to mention Maytag appliances); this room can fit just as easily into a family home. In fact, this room performs so well it might become the new heart of the home. Move over kitchen the new laundry lounge is here! For more information about the athletes and Maytag program inspired by the Pan Am and Parapan Am Games, feel free to check it out here.